No. 6, Jalan Perniagaan Setia 1/5, Taman Perniagaan Setia Business Park II, 81100 Johor Bahru, Johor, Malaysia. MP PACK Singapore Private Limited is incorporated in year 2003 with the head office located in Singapore and a branch office in Malaysia. We are a trading company, specialize on providing, packaging machines, equipment and tools, conveyors and trolleys. We can cater to all kinds of packaging materials such as tapes, films, straps, solvent and ink. We provide consultation and turnkey solution on packaging needs. Customization and automation of packing system, including integration of existing production line. We can cater to all kinds of industries as long as you have a need to pack. Our products range from simple operations to custom-made machine that caters to production line as well. We are also the authorized distributor in Singapore for some reputable brands such as LEIBINGER from Germany, ITALDIBIPACK from Italy, ZAPAK and TRANSPAK from Taiwan, DSI from Korea, YOUNGSUN from China, and our own in-house brand SUREPACK. 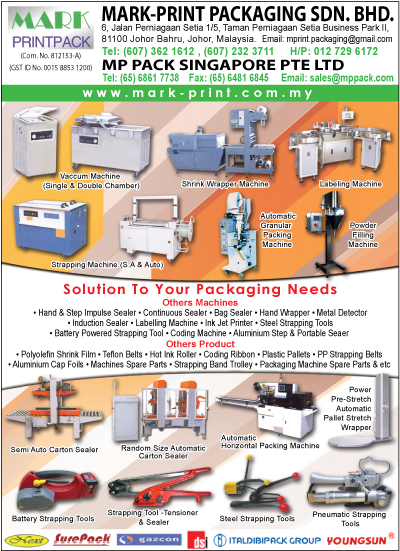 MP PACK is here to help you to achieve a lasting impact to your products through our packaging solutions. Apart from machines and equipment, MP PACK Singapore supplies a wide range of Packaging materials to the supporting industries as well. Plastic straps, Steel straps, printed straps, metal clips, tapes, polyolefin POF Shrink film, stretch film, vacuum bags and steel trolley trays are available for viewing at our website. Our service team is professionally trained in mechanical, electrical and electronic, dedicated and committed to solving your problems. We believe in providing routine services and maintenances to machineries / equipments, thus having lesser down time which indirectly increase your production output, protect and conserve the company assets. Operators and maintenances staffs will be able to plan efficiently, maximizing the machines’ capacity and production.